Edited by: Katrin Pfeiffer. Series edited by: Wilhelm J.G. Möhlig. The main object of this volume is to present a selection of the rich cultural heritage of the Mandinka people in the Gambia / West Africa. Mandinka is spoken by 1.5 mill. speakers in the Gambia, in Mali, in Senegal and Guinea-Bissau. The editor provides orally transmitted Mandinka texts and their English translation. This selection thus opens the opportunity for further studies in the fields of spoken art, grammar, sociology, cultural anthropology, history, and musicology. 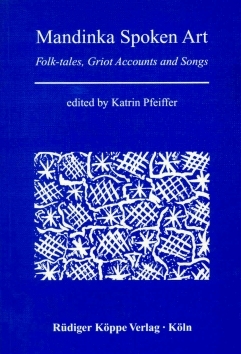 Out of an entire corpus of 296 folk-tales, 4 griot accounts, 29 songs, and about 100 riddles and 100 proverbs this volume gives a selection of 28 folk-tales, 3 Griot accounts, and 6 songs, arranged according to the genre to which the individual texts belong, thus showing a range of beautiful Mandinka texts which are representative for the respective genre. Each text is preceded by a short introduction about its content together with data about the informant, place and date of recording. The presentation of the Griot accounts is preceded by an alphabetic glossary with frequently occuring, culturally specific terms, which remain untranslated in the English text. Insgesamt gibt dieser Band einen gelungenen Überblick über die Wortkunst der Mandinka.